Fifteen lucky pilots graced the shores and skies of Kahana today, to enjoy some flying and kiting and thirst quenching, on a drop dead gorgeous trade wind day. Fifteen! On a weekday! Now that’s more like it. I’ll stop complaining that nobody flies anymore. At least for a few days. Conditions were strongish and northish, as the trade winds started to build back in, after a week of slacking off. But we knew this might be the last good day for a while, with surface high pressure slated to crank up the trades another notch, and upper level troughs predicted to deliver a soaking. Nothing brings out the rats like the threat of a sinking ship! Get your fricking gear and go! It was strong enough that jaded and grizzled veterans like Mad Dog decided to sit it out. I mean, he literally sat on the beach with Jeannine. In fact it was the first day in quite a while that I’ve flown this site without expecting to scratch my way up to find thermals. Low launch was working like a catapult! Visitor Steve from Arizona did some ground handling, along with Woody’s students Matt, Anne, Andre and Margot. Steve and Marc made the conditions look easy, as they notched their belts with a few more soaring flights. Drew flew his Firefly, but couldn't quite keep it up, and later he ran back up with his Golden for some extra wang time. Allegra flew her Zero and dialed in her top landing approaches before rushing off to work. Vin enjoyed his first extended soaring flight at Kahana. Ray showed up out of the blue with Blanca and took her for a sweet canine tandem. Jeff flew the late session in the prettiest conditions of the day, and settled into his new pod a bit more. Meanwhile I flew a textbook chronic mission between Kualoa and Punaluu, with every vista bathed in the most sublime lighting I can recall in ages. Or at least a week. Every time I think I'm starting to get used to this view I happily realize I'm wrong. 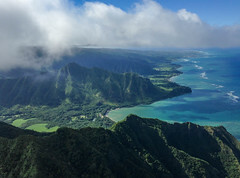 At some point, slightly above cloud base over Kaaawa, I found myself laughing out loud as I was suddenly struck by the sheer beauty of the diaphanous mist around me, the luminous mountains below, and the shining blue sea stretching away to the horizon. To top it off, when I arrived at Punaluu I found the nicest thermals waiting to twirl me to cloud base and spin me back to Kahana. So batten the hatches, patch the roofs, and tie down the chickens. It's going to be windy and wet for a week or more, as winter's rough beast shakes off months of sleep and slouches into town. But at least we have some beautiful memories to tide us over. Not to mention the prospect of a big party on Saturday! Of course it won't be flyable, I got medical clearance, yaaa, at least for another 6months...I hope. I will make sure our new guest at Therrien Stop Inn does not read this story. Although I am sure his wife Kelly, who sides with Donna on this addiction, will love the Hawaii time with her hubby. JJ Jameson loved the analogies of catapults and scurrying rats, I think I caught a glimpse of a smile. Probly better for me to be on the ground for a few more days any way. Time to Fly, Get My 'freakin' gear and go!! !